For a breed of lapdog, the Silky Terrier is not as timid as their size may fool you into thinking they would be. Spunky, curious and very energetic, they are just like the rest of the Terrier crew and full of life. Not very fond of mingling with other dogs, but they can use those stubborn and aggressive mannerisms to be effective watchdogs. They are relatively easy to train and do tend to bark on occasion. They are quite playful creatures with lots of affection to give their owners. This type of dog can get into trouble if given the opportunity, so meeting their mental stimulation cravings each day will be necessary. The Silky Terrier is very energetic, but they truly do not require very much exercise from their owners. While a simple walk on a leash will be suffice, they do prefer to have the open space to run around in if that can be provided for them once a day. While they may bode a rough and aggressive temperament at times, they do not have the capabilities to defend themselves as they are rather small in size. For this reason, they do not make a suitable breed for residing outside. They have a fur coat that will require grooming a few times per week to get rid of any debris trapped inside of it. No major health concerns to report for the Silky Terrier, but they can develop a few other ailments. Patellar luxation and Legg-Perthes disease are two of those developments to watch out for as they age. In rare occasions they can also develop diabetes, seizures, allergies, tracheal collapse and Cushing's disease. The vet may recommend screening for your Silky Terrier's elbows and knees. The average lifespan for this breed is from eleven to fourteen years long. They generally weigh only eight to eleven pounds and are an average of ten inches tall as full grown dogs. Coming from the 18th century, the Silky Terrier is an Australian breed with popularity in England as well. They once had a coat of fur that was blue and tan and had a different appeal to them than the rest of the Terrier category. Crossing Terrier breeds is nothing new as they have been known to derive from Yorkshire Terrier mixed breeding as well as the Australian ones. 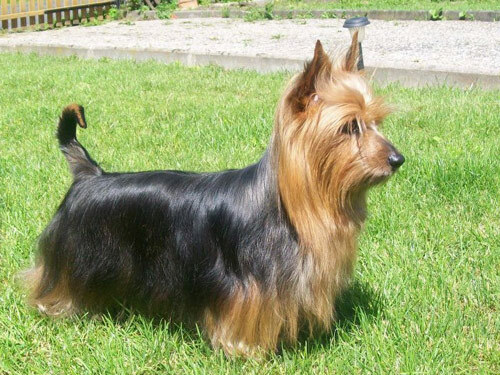 The Silky Terriers received their unique name from their difference in size as well as the length of their fur coats compared to the others. They were cross bred so often that breeding standards had to be revised in the early 1900's. The Sydney Silky Terriers was then changed to be referred to as the Australian Silky Terriers to separate them accordingly from the others, which became more clear from their weight. Around the middle of the 19th century they finally received their nod from the AKC and have since only reached a medium level of popularity. Some can do rather well as show dogs, and others are utilized for hunting small vermin.